Maureen and I attended the 20th Annual East Texas Baptist Camp Meeting. We had our display set up all five nights and made some wonderful new friends, and were able to discuss our ministry with many people. I had the privilege ministering at Osage Baptist Church in Amarillo Texas. I was able to do our power point presentation during the Sunday school hour, and was given the opportunity to preach the morning message. I was contacted by a gentleman I had worked with back in 2012 to help set up a website for Countrywide Prison Ministries. The new ministry is now Mountain State Ministries, and he was in need of a Contact Resource Management Tool (CRM) to keep track of inmates. He was currently using a tool called SugarCRM, but is at end of life and was evolving into something called SuiteCRM. I was able to set up a subdomain on one of my servers, and install SuiteCRM for him to manage his contacts. I met with Pastor Robert Moreland of Sandy Lane Baptist Church (Fort Worth Texas) and spent a couple of hours with him at the church. We have been hosting their web page (sandylane.org) since 2009. I made some minor changes to the website that allowed him to start a blog. We installed the WordPress app on his smartphone. He was able to start posting on the website through his phone. We went through the basics of pages and how to build menus. I installed a photo gallery plugin for him. I gave Pastor Moreland an overview of themes, and made a minor change in the themes to allow his Blog to show up on the website. We discussed our ministry and Pastor Moreland said he would look at the possibility of scheduling our coming out and presenting our ministry to Sandy Lane Baptist Church. I received a phone call Pastor Jeremy Allen of Calvary’s Grace Baptist Church in Eastman Georgia.Calvary’s Grace Baptist Church had a website in the past and had a lot of literature with their website on it, but the fellow that had set up the website had left their church and their domain had expired. Calvary’s Grace Baptist Church’s domain (cgbceastman.com) was available so I registered it and set up a WordPress website for Pastor Allen. He provided me with several pictures. I built a basic website, and provided Brother Jeremy with several websites of churches we host so he could get a feel for what is available out there. Pastor Jeremy will look things over and get back to me at some future point and we will work on refining (or rebuilding Calvary’s Grace Baptist Church’s website. I was contacted by brother Edward Elizondo of Fredericksburg Baptist Church in Fredericksburg Texas. Fredericksburg Baptist Church’s pastor retired and they have a new pastor.. They wanted to get a web presence back up in part so tourists can find their website, and so home bound members can listen to sermons. After some discussion about a domain name the church settled on the available domain name fredericksburgbaptist.org. Edward and I discussed what the church wanted to accomplish with the website and he picked out a template. I setup a WordPress installation for him with a SSL certificate. I spent a couple of hours on the phone with Edward and we set up the Fredericksburg Baptist Church website. He has been able to make some updates, and has a person in church that will be able to spend some time with him and give him some more one on one training. On Sunday, July 16, I had the privilege of ministering at Osage Baptist Church in Amarillo Texas. We have been hosting their website (osage-baptist.org) for 10 years now. I have spoken to Pastor David Speed many times over the last several years, and it was a blessing to meet him and the members of this friendly, small church. Pastor Speed requested that I convert their website over to WordPress, as he had been maintaining it with an Apple Mac and was running out of options. At the East Texas Baptist Camp Meeting it was my pleasure to meet Pastor Billy Barho, Pastor of Victory Baptist Church in Salado Texas. Victory Baptist Church did not have a web page. I had an “unofficial” web page up for them for a while using a “spare” domain I had (victory-baptist.com). Neither he, nor anyone in his church had any expertise in creating or maintaining a website. We had a brief discussion about what our ministry offered. I told him I could create (and maintain if he needed me to) a website for them. After some discussion Pastor Barho and his secretary decided they would like a website. I have since talked with Pastor Barho's daughter who will provide me with additional content for their website. At the East Texas Baptist Camp Meeting I had the pleasure of meeting Dr.. Paul Carlin (D. Min) (The Therapon Institute). We sat down and had a discussion. Dr. Carlin wanted to get a website for his home church (Calvary Baptist Church in Crockett Texas). 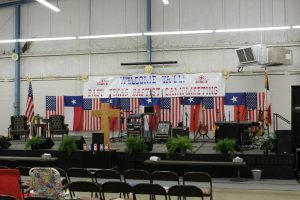 Calvary Baptist Church in Crockett Texas is a small church, and they are trying to rebuild after several problems. I registered cbccrockett.com for them. Dr. Paul has been sending me information to update the website for them as he has time. I received a call from Lampasas Baptist Church in Lampasas Texas. I had “rescued” their domain (lampasasbaptistchurch.com) last year when it had expired and they wanted to know what they needed to do to take control of the domain again. We talked for a little while and Pastor Stall decided that he would like to keep their domain on our hosting, and that his son would update the website using WordPress. I installed a WordPress Website for them with an SSL certificate, and gave them the login credentials. They were able to get a basic website up and running in a short amount of time. 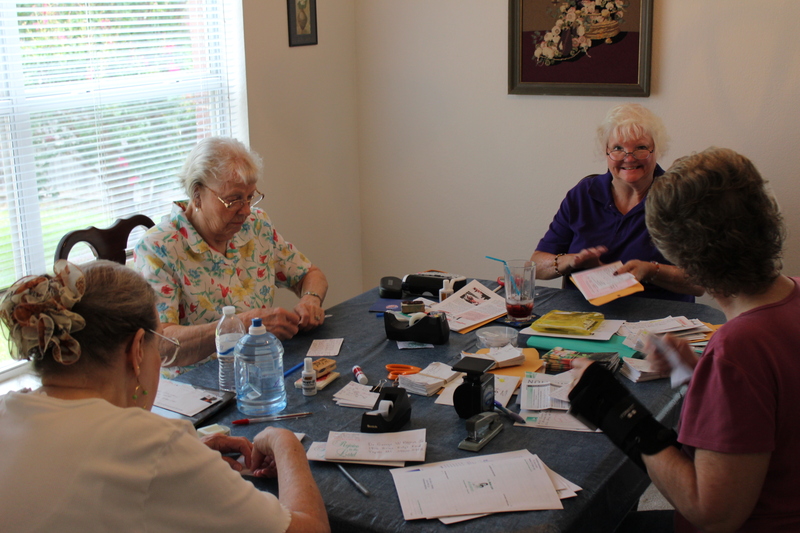 Bible Correspondence Courses: We want to thank Katherine Feguer, Lydia Henrici, Lorraine Meier, J.L. & Florence Smith for helping on the Bible Correspondence courses over the last quarter. Lessons mailed 1030, Certificates 19, Students 166 (Nigerian 100 and Prisoners 9) Australia, Brunei, Cameroon, Nigeria, Tanzania and USA. From a 71 year old student in Arkansas… I really enjoyed the Light from the Old Testament course. I learned so very much. I had never realized that the sanctuary was all about Jesus. Thank you so much for letting me take these courses. From a Pastor in AL… In this booklet I learned what was inside the Ark and how the whole courtyard speaks of Christ. I loved this lesson. Very informative. From a prisoner in MS..Thank you for sending me the Bible study lessons to work on and for allowing me to continue in studying God’s word with FamilyNet. I learn things that I never knew before with each lesson that I complete with FamilyNet. I trust you can send the replacement certificates for the Bible study courses that I completed thank you. I said a prayer for you that you can find someone to help you with your Bible correspondence program. Keep me in your prayers as I continue to rebuild my life and live fully for the service of our Lord and Saviour Jesus Christ. Tract Ministry: We have "given out" over 84,000 Bible Tracts online. This last quarter we saw two get saved in Cameroon (husband, then wife) from the "New Birth" Bible Tract. They have enrolled in our Bible Correspondence Courses and want to evangelize Cameroon for Jesus! Social Networking Outreach: I get new requests on my evangelistic Facebook account regularly. I now have 2603 "friends" in my evangelistic Facebook account. This is a valuable tool to reach the unsaved. Support: We are currently at 67% of support for our ministry expenses. Miscellaneous health needs – lots of minor stuff. Bob is going in for a stress test, and has a follow up prostate test next week. Prayers appreciated! Reliable transportation – we have two old vehicles. They are costly to repair on a regular basis.We can't trust either vehicle to make trips of any distance. We have two A/C units that are living on borrowed time. Both units are 18 years old using Freon. Loss of coolant or failure of any major parts will require replacement. We have a 2 1/2 ton unit in the back of the house where the Computer/Office Space is and a 3 1/2 ton unit where the living are is. PreviousFrom a prisoner in MS..